She is a Dhampir that is aged 17, she is lithe, with a dancers build, and a little over five feet tall. 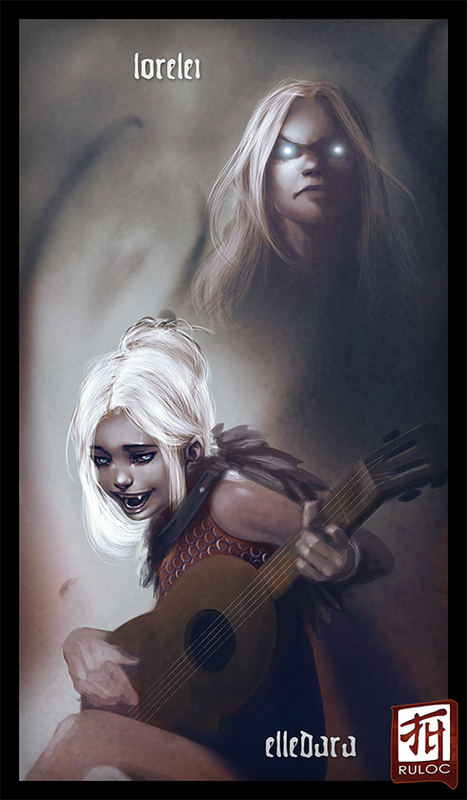 She has split personality disorder, one is a bard and that is the one that is the primary. She is chipper and very much a social person. She carries a rapier, but rarely draws it and instead focuses on her music, by playing a guitar. This one answers to Elledara. The second personality is darker, and a sorceress, she is cold, and aloof, and would prefer to strike you down first then speak with dead to ask you her questions. This one goes by Lorelei.